It’s hard to find another gold coin that will encompass so many benefits of owning it than a Gold Krugerrand. Unsurpassed quality, high investor and numismatic demand and low premium costs compared to other coins of its class, place this product among the top choices to buy no matter if you are shopping to replenish your collection or portfolio. These coins are struck using 22 karat gold making them super scratch resistant and able to preserve their original shape. When most people talk about a Krugerrand they are referring to the original 1 oz gold Krugerrand. This is the only original size that was created, and that was a one troy ounce coin. This gold Krugerrand was first minted in 1967, and is still what most people mean when they talk about the Krugerrand. In South Africa gold Krugerrand is legal currency. This means that buying gold bullion in the form of Krugerrands gives you a mechanism that can also be used as cash in this country if needed, or turned in to any foreign currency exchange office. This form of gold investment is usually not subject to import taxes because it is legal tender. Starting in the year 1980, Krugerrand gold bullion coins were slowly introduced in smaller sizes, which are called fractional sizes. 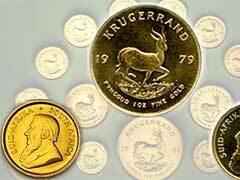 These Krugerrand gold coins can be found in three other sizes, a half ounce, a quarter ounce, and a tenth ounce coin. The premiums for these coins are much higher than the one ounce version though. This coin has a solid history, and these coins have been minted every single year since the first minting in 1967. Other forms of bullion, like Canadian gold bullion and American bullion, may not have the same solid history that the South African coin does. When you buy gold Krugerrand you are getting a known quality and quantity. They are one of the best ways to invest in gold bullion, because of all the benefits that these coins offer. Each coin is stamped with the weight of the coin, as well as the mint date, so there is never any doubt about the quality or quantity.